After shutting out the Chicago Cubs offense over six innings of 10-strikeout ball, Drew Pomeranz lowered his season ERA to 1.80 and FIP to 2.61. He currently ranks 3rd among qualified starters in K% and is tied for 11th in WAR. Furthermore, Pomeranz has faced four of the top five offenses in the National League, as well as having had a season opener at Coors Field, hence we cannot claim stat padding against mediocre competition. While a .250 BABIP and 82.1 LOB% may not exhibit the greatest signs of stability, Pomeranz is finally reaching the potential that garnered him a top-30 prospect ranking from Baseball America. So what has Pomeranz done to unlock this potential? Pomeranz has discovered his newfound success by neutralizing right-handed bats. Earlier in his career, Pomeranz’ relative struggles against righties led many to wonder whether his ultimate fate rested in the bullpen. In fact, heading into 2016 many doubted whether he could even earn a spot in the Padres rotation; he couldn’t even earn a mention in Jeff Sullivan’s positional preview post. This sentiment was understandable given his career .340 wOBA against and 7.1 K-BB% when facing right-handed hitters up to this point. In 2016, however, he has lowered the wOBA against to a measly .240 while striking out 34% of righties. By dropping 100 points of wOBA, he’s essentially transformed his average opposite-handed plate appearance from Kyle Seager to Omar Infante. As with any dramatic improvement in performance, a confluence of factors has led to Pomeranz’ success. Since debuting in 2011, Pomeranz has gradually raised his vertical release point up nearly half a foot. This more over-the-top delivery has undoubtedly provided him greater deception against righties. More noticeably, however, Pomeranz has brought his changeup back from the dead. Early in his career, Pomeranz threw his change roughly 9% of the time to righties. From 2013-2015, when 72% of his appearance came out of the bullpen, Pomeranz lowered that rate to 3%. This season, however, Pomeranz is utilizing his change-piece over 15% of the time against right-handers. Throwing it around 87 mph, Pomeranz’s change nearly perfectly mimics his sinker in both velocity and movement, but to differing results. Pomeranz generates an above-average 44% fly balls on balls in play with his change, while the sinker gets 67% groundballs. This deception, combined with Pomeranz’s pitcher-friendly home park, have led to a dearth of quality contact on the changeup, as illustrated by the .111 ISO against on the pitch. Despite the resurgence of Pomeranz’s changeup, his improved curveball has been the true game-changer. He trails only the enigmatic Rich Hill in percentage of pitches that are curveballs; likewise, he employs it over 43% of the time against righties, up from 23% over his career before joining San Diego. His 4.6 curveball pitch value trails only the Phillies duo of Aaron Nola and Jerad Eickhoff, and their club’s experimental pitching philosophy, so far in 2016. After leaving the breaking-ball-murdering confines of Coors Field in 2014, Pomeranz witnessed a significant increase in both vertical movement and velocity. This, however, does not explain his recently-discovered success. Similarly, he has kept his Zone% on the curve right around his career average of 43%. The key lies in where out of the zone he locates the ball. This season, Pomeranz is hitting low-and-gloveside off the plate with almost 30% of his curves to both righties and lefties alike. Prior to this campaign, Pomeranz only hit that spot about 10% of the time, as he more evenly distributed his curveballs across the zone horizontally. Whether a change in approach or simply improved mechanics and command, Pomeranz is finding tremendous success with his hook. Using the curve against righties, Pomeranz has raised his Whiff% to a career-high 16.4% in addition to generating a career-high 39.6 Swing %. Furthermore, nearly three-quarters of his balls in play off the curve are grounders and he has yet to permit a single fly ball on the pitch vs. right-handed hitters. As Eno Sarris noted in his discussion with him last December, Pomeranz’s success hinges on three things: “his health, his changeup, and his curveball.” Seven starts into the season, Pomeranz’s progress on these three fronts has led him to success against righties and helped him unlock his prior potential. He’s gone from a guy the Athletics traded for spare parts to a solidly above-average starter for the Padres. Perhaps the most encouraging aspect of this emergence: Pomeranz is still only 27 years old. With almost three more years of service time left, and an inevitable sell-off of Tyson Ross, Andrew Cashner, and James Shields on the horizon, Pomeranz could potentially parlay his improvement into an ace role on the Padres staff. Of course, Pomeranz could find himself on the market in the near future, and he would certainly fetch more than Yonder Alonso and Mark Rzepczynski this time around. As a former No. 1 overall draft pick, No. 1 overall prospect, three-time batting champion, and 2009 American League M.V.P., Joe Mauer seemed destined to dawn a Twins cap in his inevitable Hall of Fame induction. He claimed the title Mr. Minnesota, and the Twins payed him as such when they inked him to an 8-year, $184M contract starting in the 2011 season. However, Mauer’s sudden drop in production following his full-time conversion to first base left many Minnesotans cursing his name and clamoring for the vintage Joe Mauer. As a small market franchise attempting a rebuild, Minnesota desperately needs Mauer to live up to his contract if they plan to contend with their rising young core. While 2016 has started off miserably for the Twins – their division odds have already sunk from 7.6% to 1.5% – a resurgent Mauer provides one bright spot in an otherwise bleak outlook. While the usual sample size caveats apply here, Mauer’s improvements appear more than superficial. Through the first couple weeks, Mauer has crushed the ball to the tune of a 173 wRC+, and has already surpassed his 2015 fWAR. He has raised his BB% to 12.8, the highest it’s been since 2012, cut his K% down to 8.5, lowest since 2008, and upped his isolated power to .154, its highest mark since his M.V.P. campaign in 2009. While Mauer most certainly cannot maintain his current .371 BABIP, underlying signals suggest that he may have broken out of his two-year slump and regained his All-Star form. One indicator: his resurgence in batted-ball prowess. So far this season, Mauer’s Hard% is up greater than 10 points over the past couple seasons and has risen back to his previously dominant levels. Similarly, Mauer is pulling the ball more than ever, and is going to the opposite field less than ever before. Perhaps this is a sign of Mauer adjusting to an aging body – as his bat speed diminishes, he might swing earlier to try and get ahead of the ball. Another encouraging sign: his line-drive rate has risen to 33.3%, the highest he’s ever had it, while his fly-ball rate has diminished to 19.4% the lowest he’s ever been at. Considering how much his home park, Target Field, suppresses left-handed power, this seems a wise adjustment to make. On the downside, Mauer’s HR/FB rate and IFH% reside above his expected rates, providing obvious areas for his power and BABIP to regress. However, the overall batted-ball picture remains encouraging. In addition to batted balls, Mauer is displaying an overall different approach at the plate. His O-Swing% is back to its previous low form while his Z-Swing% and overall Swing%, have sunk to their lowest levels in his career. After Baseball America rated him as having the best strike-zone discipline in the American League in 2012, his chase rates spiked tremendously in 2013 and had remained there since. Now Mauer seems to have regained that lauded discipline. Furthermore, his Zone% has actually dropped each of the past three seasons; this combination of less pitches in the zone and fewer chases out of it explains his rising walk rate. Additionally, Mauer has significantly raised both his O-Contact % and Z-Contact%. Overall, it appears Mauer has become more selective on which pitches he feels he can barrel up, hence the rising contact and line-drive rates. Now if Mauer truly has made critical adjustments to improve his game, then we should expect to see pitchers alter their approach as well. Baseball is nothing if not a game of adjustments. According to Brooks Baseball, Mauer’s current relative mix of hard, breaking, and off-speed pitches seen remains the same as ever, suggesting that no major adjustments have been made yet. However, if his bat truly is slowing down and these are his adjustments, we should expect to see pitchers start attacking him with fastballs up and in. Currently, Mauer sees roughly 1/3 of his pitches off the plate low and away. Realizing that he won’t chase those anymore, pitchers will presumably begin attacking him in the zone more often. Whether Mauer can turn on these pitches and continue lining the ball the right will determine whether or not these results stick. In the big picture, small-sample variance likely explains most of Mauer’s current success. However, Mauer does appear to at least be attempting to adjust his approach, hence we should not entirely disregard these results. Up to this point, Mauer has shown significantly more selectivity in which pitches he swings at, particularly in the zone, letting him barrel up the ones he feels he can hit with conviction. As pitchers adjust to his adjustments, we will see whether Mauer has truly made a triumphant return. The Twins desperately hope Mauer can maintain a modicum of these results, as he will earn $23M a year through 2018. Unlikely to go out and make a major free-agent splash, Minnesota needs Mauer to provide value commensurate to his contract if they plan to capitalize on their youth movement. Once (if) Sano, Buxton, Berrios and company develop, the Twins could have a devastating roster led by Mauer. Until then, in a season marred by underperformance and disappointment, the return of Minnesota’s favorite son could provide a potential beacon of hope. Oftentimes, preconceived notions inhibit our understanding of the game of baseball. From archaic methods of player evaluation to cultural expectations of players of varying ethnicity, each observer’s individual paradigm dramatically alters his or her view of the game. Case in point, what common ground could Salvador Perez and Kevin Pillar possibly share beyond their profession? Perez, who recently inked a new contract extension with the Kansas City Royals, stands at a booming 6’3’’ and 240 lbs. Pillar measures in at a more svelte – for professional athletes, at least – 6’0’’ and 205 lbs. Perez signed with the Royals in 2006, at the age of 16, as an international free agent out of tumultuous Venezuela before Pillar had even graduated from Chaminade College Prep, a private Catholic school in San Fernando Valley. Pillar finally signed his first professional contract after being drafted by the Toronto Blue Jays in the 32nd round of the 2011 amateur draft, less than a month before Perez debuted in the Majors despite being two years Pillar’s younger. Examined from a cultural and personality standpoint, Perez and Pillar seem polar inverses of one another. Herein lies the beauty of baseball, and sports in general – citizens from all walks of life can come together, abandon their differences, and enjoy a common passion. From first pitch to the final out, no one differentiates between the hulking, affable Venezuelan catcher and the agile, analytical outfielder. Indeed if you only considered their projected on-field contributions, you may discover them indistinguishable. Projections courtesy of FanGraphs’ Depth Charts, a combination of ZiPS and Steamer, provide us our best estimate of a player’s “true talent” level. No, projections are not infallible, but for this exercise they convey more than enough. Perez and Pillar share striking similarities in their statistical profiles. Solid defense up the middle, meager walk rates complemented by above-average strikeout rates; even the “old school” stats and classic triple-slash lines bear remarkable resemblance. The summary stats further these parallels; both players project around 3 fWAR for the upcoming season, while only one point of wOBA separates them. The only appreciable area of separation resides in base-running, where Pillar’s stolen bases give his BsR a four-run edge over Perez’. Otherwise, Pillar and Perez mirror each other with regard to their contributions on the diamond – the only facet we should judge players by. Perhaps more compelling, their overall approach. The below table lists each players’ plate discipline statistics from the 2015 season, as found on FanGraphs. Both player profiles match what we should have expected given their walk and strikeout rates above: free swingers, particularly at pitches outside the zone, with an above-average ability to make contact. (Statistically speaking, among qualified batters Perez and Pillar both rank in the top quartile in Swing%, the 96th percentile in O-Swing%, and top half in Contact%). Nonetheless, the proximity of their plate-discipline statistics encapsulates how comparably Perez and Pillar approach an at-bat. Having not revealed the identity of the two stat lines* illustrates one of the charms of the game. No matter the background, personality, religion, whatever you may have, we convene to cherish a game we love. With an abundance of animosity arising over “playing the game the right way”, cultural lines oftentimes artificially divide us. We can choose to continue making these superficial discrepancies, or we can focus on what ultimately matters most, the product on the field and the joy it brings to our lives. To say the market disappointed Ian Desmond would massively undersell the circumstances. After rejecting a 7-year, $107 million contract extension from the Washington Nationals prior to the 2014 season, Desmond now settles for a reported $8 million pillow contract with the Texas Rangers. Having been tagged with the qualifying offer, Desmond joined Yovani Gallardo and Dexter Fowler, among others, in witnessing their market evaporate due to the associated draft pick compensation. A career-long shortstop, Desmond attempted to work around this hindrance by marketing himself as a “super-utility” type, and indeed signed on with a club set at shortstop. Now the former Expos prospect hopes a shift to left field will recoup the value lost during a disastrous 2015 campaign. Indeed, disastrous accurately portrays Desmond’s terminal season in the nation’s capital. Having posted three straight 4+ fWAR seasons from 2012-2014, Desmond appeared in line for a massive payday this offseason. Instead, a 1.7 fWAR, 83 wRC+ campaign left Desmond with minimal market appeal, at least at his initial asking price. Perhaps more worrisome – his continuous decline. After peaking at 128, Desmond’s wRC+ fell each of the last three seasons while his strikeout rate catapulted to nearly 30% the past two seasons. Similarly, Desmond’s hard-hit rate dropped nearly four percentage points in 2015, with the difference transferring to soft contact, while his groundball percentage rose each of the last two seasons. If you make a career out of slugging the ball, softer contact and more groundballs is just about the worst combination of progressions to make. At his peak, Desmond stood among the premier power-hitting shortstops in the game – his .188 ISO from 2012-2014 ranked third among qualified shortstops, behind Hanley Ramirez and Troy Tulowitzki. Now, after shifting to left field, he provides more of an average to below-average bat while learning a new position. Furthermore, that pitchers altered their approach against him likely dissuaded some interested parties. Since his powerful peak, Desmond has seen an increase in sliders with an accompanying decrease in pitches thrown within the strike zone. During this time, Desmond suffered a precipitous drop in contact rate on pitches outside the zone. Perhaps pitchers discovered a weakness against sliders out of the zone, a point only accentuated by the fact that Desmond’s pitch value against sliders in 2015 rated at -5.8, the 18th worst value in MLB. Even during his peak, however, Desmond consistently ranked among the league’s highest swinging-strike rates, perhaps indicating an inevitability to the skyrocketing strikeouts. Either way, Desmond’s penchant for swinging and missing surely concerned any club contemplating a long-term investment. 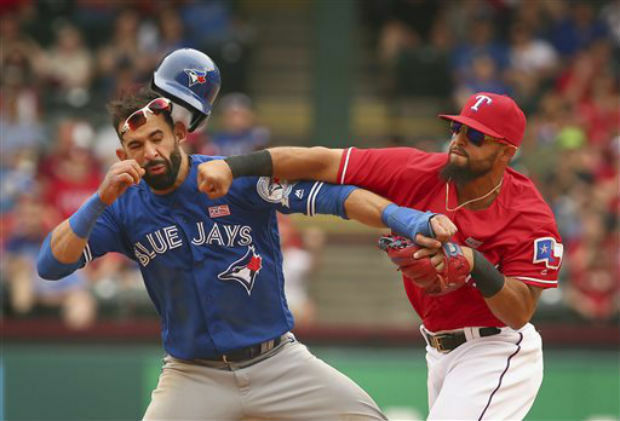 The Rangers appear not overly concerned with the strikeouts, at least not at the current cost. Between his salary and the draft-pick compensation, Texas seems to be expecting only about 2 WAR from Desmond, an entirely average forecast. Steamer pessimistically projects Desmond to accrue 1.4 WAR over 585 plate appearances, while ZiPS estimates a more fortuitous 3.1 WAR in 623 PAs. Averaging the two, you glean a smidge over 2 WAR in roughly 600 PAs – a figure almost perfectly in line with his acquisition cost. Of course, your personal perception of Desmond depends largely on how you see him transitioning to left field. As an athletic shortstop with solid defensive history, one might expect Desmond to convert at least reasonably well. However, ask any Red Sox fan about Hanley Ramirez’ move, and you’ll understand some apprehension. With Rougned Odor, Elvis Andrus, and Adrian Beltre locking down the other infield spots, Desmond will occupy left the majority of the time. Desmond could additionally work at 1st base to rest Mitch Moreland against tough lefties, although that would squander his athletic ability, as well as encroach on Justin Ruggiano’s role even further. Moreover, this signing insinuates that the front office holds little hope for Josh Hamilton staying productive and healthy this season — an entirely fair position considering he has taken the field for only 139 games the past two seasons combined — as well as a damning assessment of Ryan Rua’s ability to contribute to a contender. As defending division champions, the Rangers aim to maximize what’s left of the Yu Darvish/Adrian Beltre window, and bridging the hole in left until Nomar Mazara or Joey Gallo arrives certainly occupied a spot on their to-do list. But for a team anticipating to contend, was adding the uncertainty of a position switch truly the best path to take? At the given contract, Texas should be ecstatic they picked up a recently All-Star caliber shortstop. It’s been accepted for a while that Texas is “in the range of where [they]’ll end up payroll-wise”, according to Jon Daniels, hence cost-prohibitive acquisitions of Justin Upton, Yoenis Cespedes, and Jason Heyward simply weren’t on the table. That understood, the market provided other, more cost-efficient options without the risk associated with the position swap. Recently signed Dexter Fowler only cost $5 million more than Desmond (both having draft-pick forfeiture attached to them), and is projected for a similar WAR output while making a less imposing transition from center to left. Furthermore, Fowler would have provided a back-up for center fielder Delino DeShields that Texas sorely lacks. Along that same line of thinking, the still unemployed Austin Jackson would have provided a slightly lower projection, but without the relinquishment of the 19th overall draft pick. My personal favorite option this offseason, Steve Pearce, signed for less than $5 million to play part-time for the Rays. Surely Texas could have offered him a similar contract at the time, where he could have provided right-handed power both in left and at first base. I would have thought Pearce or Jackson the more frugal acquisition for a cash-strapped Rangers ballclub, but palpable potential exists for Desmond to recapture his past success and make this deal quite the bargain. At one guaranteed year, this acquisition carries minimal risk while providing real talent to a contender; it’s difficult to dislike, even if you believe that more cost-efficient options exist.